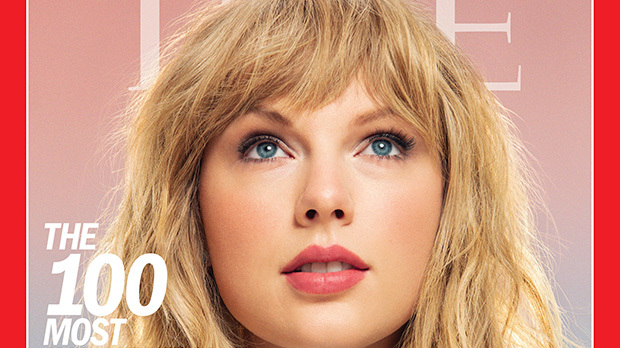 Taylor Swift looks flawless on the latest cover of ‘TIME’ magazine’s, ‘TIME 100’ issue, as she gives subtle hints about her music again, with her pastel sweater, lipstick, and her heart-shaped ring. Taylor Swift, 29, just landed the cover of TIME magazine’s, 2019 TIME 100 issue, the annual list of 100 most influential people in the world. The blonde singer looked fresh-faced on the cover as she posed with barely any makeup on besides a bright pink lip and voluminous lashes. Meanwhile, her new hairstyle was styled into a layered lob with fringed and frayed straight bangs. While her flawless glam on the cover grabbed our attention right away, it was her subtle hints that pulled us in. First off, the background of the cover is a faded blue and pink pastel sky, similar to Taylor’s new cloud profile picture on Instagram. Plus, the songstress chose to wear a soft pastel blue sweater for the cover, and she chose not to wear any other accessories except for one single gold ring featuring a huge white heart, and she rocked a pretty pink lip. Although these clues are very subtle, they all coincide with Taylor’s recent music countdown. In the inside photo for the article, the background is still the same, but Taylor is pictured in a flowy pastel pink sleeveless dress with a plunging neckline and a cinched in waist with a satin bow belt. The singer is still wearing the pink lip, but can also be seen sporting a pair of gold drop earrings featuring little butterflies. Recently, Taylor has been dropping subtle hints about her new music, all over her Instagram page, changing her entire aesthetic from black-and-white to girly pastels. She posted a photo of a diamond heart shaped ring on April 14, captioning the photo, “4.26.” Since then, she has posted a slew of photos featuring the same pastel color scheme of pink, blue, and purple, while most of her photos feature hearts. On April 15, she shared an up-close photo of her multi-colored sparkly pink and blue manicure, while her fingers were embellished with colorful rings, one of them being a heart-shaped silver ring. This issue officially marks Taylor’s third cover of TIME, with her first being in 2014 for the issue, The Power of Taylor Swift, then in 2017, Taylor was chosen as one of TIME’s Person of the Year as the Silence Breakers. The 2019 TIME 100 Issue features six covers, including Taylor, Nancy Pelosi, Dwayne Johnson, Sandra Oh, Gayle King and Mohamed Salah.